Dress appropriately for hiking in the cold. People who want to sleep outdoors when it's colder than 32 degrees outside need to be well versed in winter camping safety. Those that venture out unprepared are at risk for frostbite and hypothermia, both of which can set in fairly quickly. 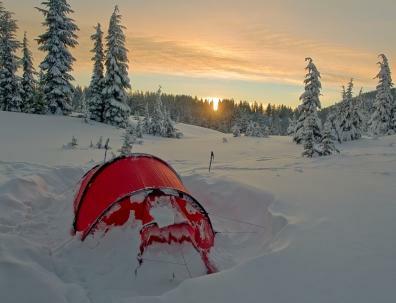 If done properly, camping in the winter can be very rewarding. It not only tests your survival skills, but a snowbound site can be quite beautiful. It's also a prime opportunity to do some skiing or snowshoeing. There are several things you need to think about when planning your winter camping trip: what you should wear, what gear you should bring and what actions to take to ensure your safety once you arrive. Bring layers. This way you can add more clothing if you get too cold and remove some of it if you start to overheat. A good winter camping wardrobe includes long underwear, a fleece or moleskin sweater, waterproof pants, a waterproof ski jacket, a fleece ski hat, two or three pairs of gloves and two or three pairs of socks. Stay away from cotton garments since they absorb sweat, which can make the risk for hypothermia greater. Wear boots. While you may live in sneakers or other low-top shoes, do not do so on your camping trip. Bring boots that reach past your ankles so that snow and other types of moisture cannot get inside them. Check the bottoms to make sure they have good enough traction to keep you from slipping on ice and snow. Don't forget eye protection. Summer isn't the only time when your eyes can get damaged by UV rays. In fact, the glare from the snow can seem as bright as the sun itself. Bring wraparound sunglasses or ski goggles to protect your eyes from the front and from the peripherals. Invest in a cold weather tent. When you're shopping for a winter camping shelter, look for the term "all season." Many tents, especially ones that are on the inexpensive side, are not weatherproof enough to handle whipping winter winds or being set up on snowy ground. It's best to get one that you can set up and take down quickly so you can be exposed to the elements for the shortest time possible if caught in a sudden blizzard. Put alkaline batteries in your flashlight. They last better than other types in cold weather. Put a piece of tape over the power button so you don't turn it on accidentally. You could be in quite a bind if it fails to work. Look for a liquid fuel stove. You may have a hard time starting a fire in the winter since the wood is likely to be either wet or frozen to the ground. Always use the stove outside, not in your tent. Don't camp alone. Even if you enjoy the solitude of a winter's day by yourself, now is not the time to indulge. If you get hurt or ill, you need someone there who can get you help. Since there are far fewer campers during wintertime, the chances of someone coming across you are slimmer. Let someone not on your trip know exactly where you are going to be. Keep track of smaller gear. Tie small pieces of gear, like pocket knives, to larger pieces of gear so they don't get lost. If you drop an item in deep snow, it will be difficult to find it again. Keep extremities dry. If your socks or gloves get wet, change them immediately. The fingers and toes are two of the most common areas for frostbite to set in. Keep moisture out of your sleeping area. Take off wet clothing before entering the main area of your tent. You want it to stay warm and dry, so keep the water out. Share your knowledge. Advise all of your camping companions about these winter camping safety tips.